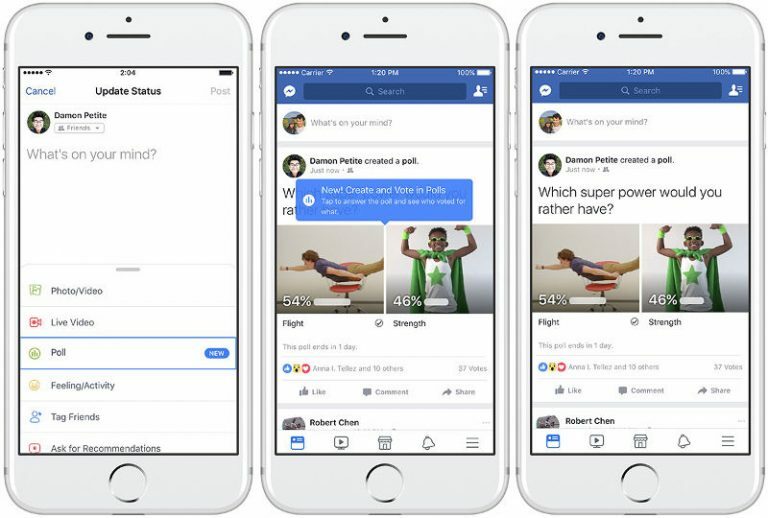 The Facebook has rolled out gif-supported polls feature that now lets you add gifs and photos as poll answers instead of old-school text options. Facebook has added stickers as polling options to Stories feature on Instagram just last month. Facebook seems to have borrowed the feature from Twitter which lets you add four gifs, unlike just two on Facebook. Facebook had the poll feature for quite some time; now it has made the feature much more interesting and user-engaging with the gif options. To create one, just click on ‘Whats on your mind’ and below the text box, you will see ‘Poll’ option just tap that and type in your question. While there is no limit to the length of the question, the responses are limited to 25 characters. To add GIF or photo to the poll, hit the camera or GIF icon in the options line from there you can add photos or put gifs as responses. You can even add the duration for how long you want the poll to run. Though Twitter supports up to four options, Facebook, for now, has support for only 2 GIFs or photos. The GIF-supported polls feature is available both on Web and iOS and Android mobile apps as well.